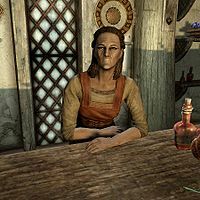 Arcadia is an Imperial apothecary and the proprietor of Arcadia's Cauldron, an alchemy shop in Whiterun. She sells potions and poisons and allows you to use her alchemy lab. She even gives you a hint about how to create a healing potion, should you happen to ask. She uses her skills to provide expert training in Alchemy and also works on creating a love elixir to test on an unsuspecting castle wizard. She sleeps in her bed above the main trading room every night between midnight and 8am. She then unlocks the doors and spends twelve solid hours offering her various services to paying customers. From 8pm until her bedtime, she wanders around the shop, at times relaxing, eating, or working at her alchemy lab. She is never seen outside her store. She wears a set of clothes with a pair of boots. She carries an iron dagger, the shop key and a selection of common items and gold. When you enter her store, she will readily give you the full sales speech, randomly picking between: "You'll find tonics, salves, poultices and potions on my shelves. Browse to your heart's content. ", "If there's anything I can help you with, you have but to ask. ", "I offer remedies for ailments both common and rare. Do let me know if I can be of service. ", "I sell cures for all ills, and I'll be happy to serve you. ", "Maybe a hardy Nord like you doesn't need a cure-all. Hmm? What about an invisibility potion?" or simply: "I have several elixirs for sale." She will also claim you are sick, just to sell her products: "You look rather pale. Could be Ataxia. It's quite a problem back home in Cyrodiil. ", "Pardon me, but do I detect a case of the Rattles? I've got something for that." She will finish conversations with: "Come back anytime if you need a remedy." Also, if you ask her about training, she will comment: "I think I can teach you a thing or two." Should you invest in her store, she will say: "By helping me, you're helping the good folk of Whiterun. How could I say no to that?" or "May prosperity bless us both!" When asked, she will tell you about her profession: "Of a sort. I don't have formal training in the Restoration school, but... something just as good. Within these walls, I have all that I need to brew a potion for nearly any ailment. If I had a Septim for every case of Rockjoint or Witbane I've cured since I opened this shop, I'd be a rich woman indeed." When asked if she misses Cyrodiil, she will reveal her political stance: "Why, because I'm a proud citizen of the Empire? Because the Stormcloaks only want Nords in Skyrim? The Stormcloaks can rot in Oblivion for all I care. I've lived in this city for twenty years. Twenty!" Her strong political stance will be turned into frustration if the Stormcloaks conquer Whiterun. She will then greet you with: "These Stormcloaks are ridiculous. They won't shop here because they think I'll sell them poisoned tonics. I should just go back to Cyrodiil." If you accept to do Farengar Secret-Fire a favor and bring his special salts to Arcadia, she will reveal what it is used for: "Ah, splendid, splendid. It's for a special brew I'm working on. A love elixir like none other. Maybe I'll test it on Farengar first... Oh, but I suppose you expect some compensation. Um... here, these potions should suffice." Salt for Arcadia: Farengar asks you to deliver some frost salts to Arcadia. Arcadia is depicted on the Cauldron Keeper card in Legends. Arcadia will sometimes say "Maybe a hardy Nord like you doesn't need a cure-all." regardless of your race. Arcadia will sometimes use her normal generic dialogue like "If there's anything I can help you with, you have but to ask." while she is sleeping, no matter where you are in her store. Her body will never disappear and, as a result, nobody will take over her store. This page was last modified on 22 December 2017, at 06:03.